To estimate the benefits and costs of dams in the Pacific Northwest, we need to estimate the value of Salmon. To estimate the value of Salmon, we need to count the Salmon. To count the Salmon, we need to hire someone that can count fish. To hire someone that can count fish, we need to pay the fish counters. To pay the fish counters we need federal money. To get federal money we need the support of a congressional representative. To get elected, the congressional representative from the Pacific Northwest needs the support of electricity producers. To get the support of electricity producers the congressional representative needs to up-play the value of dams in the northwest. To up-play the value of dams the congressional representative needs to downplay the value of fish. To downplay the value of fish, the congressional representative needs to accuse the fish counters of advocacy and cut their federal funds. See how that works? ... as the trio of Katrina, Rita and Wilma were battering Southeastern coasts, a controversy was brewing over the reasons for the rise in hurricane havoc. At issue: Is it a natural fluctuation or a product of global warming? ... a pair of scientific papers this year detected an unexpected spike in storm intensity over the past several decades, suggesting that global warming might already be having an effect. The research set off a passionate debate in the small community of storm scientists. It is still far from settled. The article focuses on the spat but misses the important policy implications, a bit. Climate change policy will have no impact on the damages from the expected spike in storm intensity. Up to 10,000 delegates from 189 nations meet in Montreal from Nov. 28-Dec. 9 for the first annual climate talks since the U.N.'s Kyoto Protocol on curbing heat-trapping gases, mainly from human use of fossil fuels, entered into force in February. Many Kyoto nations want Montreal to launch negotiations, likely to last years, on setting new curbs once Kyoto's goals run out in 2012. Kyoto is a bid to slow climate change that may trigger more hurricanes, droughts and rising sea levels. But the United States and Australia, which have rejected Kyoto as a straitjacket threatening economic growth, do not want to discuss binding commitments. Here is what I think, I guess. This is an exciting time for AERE. We are on the verge of launching a new journal, Review of Environmental Economics and Policy (REEP). The editors will be Rob Stavins (Harvard), Carlos Carraro (Venice and FEEM), and Charles Kolstad (UC Santa Barbara) with Rob taking the lead. 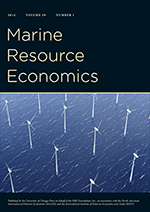 Our new journal seeks to fill a niche similar to the Journal of Economic Perspectives by publishing less technically oriented papers that will help advance the policy debate on key environmental and natural resource issues. This is great news. The J of Econ Perspectives publishes readable articles, sans equations, on economic issues of importance. An AERE journal with the same purpose would be great way for policy makers (i.e., their staffers), students and others (i.e., me) to get a better handle on current environmental economic research and policy prescriptions. What happens when a natural disaster demolishes a popular tourist destination? Well, the federal government declares it a Federal Emergency and everyone is bailed out, right? Not in Mexico. A horse-drawn wagon pulled up to the White House Monday with an 18 1/2-foot Christmas tree that will adorn the Blue Room, marking the official start of the holiday decorating season at 1600 Pennsylvania Avenue. A while back we started an introductory series on the methods environmental economists use to value environmental goods and services. In previous posts, we have looked at the theory of benefit estimation, the travel cost method, the hedonic method and the averting behavior method. We continue the series with perhaps the most popular and controversial of the methods: the contingent valuation method, or CV for short. New York is adopting California's ambitious new regulations aimed at cutting automotive emissions of global warming gases, touching off a battle over rules that would sharply reduce carbon dioxide emissions while forcing the auto industry to make vehicles more energy efficient over the next decade. The rules, passed this month by a unanimous vote of the State Environmental Board, are expected to be adopted across the Northeast and the West Coast. But the auto industry has already moved to block the rules in New York State, and plans to battle them in every other state that follows suit. This article is interesting simply because all sides of the issue continue to drage out the same-old-tired disagreements between industry, environmentalists and the regulators. For example, due to the new regs the state says that car prices would rise by an average of $1000 and the industry says $3000. Rob is, of course, making a joke. The chances are infinitesimal that the clown show headed by George W. Bush will assume an international leadership role on global warming. Burn. There are some great comments as well.